Timing Belt Tensioner Noise After Replacement - What To Do? Timing Belt Tensioner Noise After Replacement – What To Do? After doing a timing belt replacement, your car may make some loud sounds. If this happens, it may be timing belt tensioner noise. Here are some tips to help you determine if this is the case. The first is to verify it is timing belt tensioner noise. You can determine this by pulling over, opening your hood and listening to where the sounds originate. The cause of these can happen when you notice timing belt problems, so you change the belt. However; unless the tensioner belt pulley is in the correct place, your belt will be loose, which can cause loud noises and serious damage to your engine. 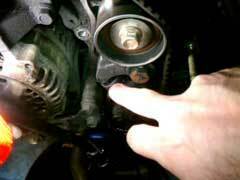 If you notice the sounds come from the belt area, it is likely timing belt tensioner noise. You’ll want to inspect all components including the timing chain tensioner to make sure all parts are working correctly. It is important to note that getting to each part can be a tricky and complicated process, therefore if you are unsure can do it you may want to take it to a mechanic. However, if you want to dive right in, here are some steps to determine if it is timing belt tensioner noise. To get to the tensioner pulley you will need to remove the drive belt, crank shaft pulley and damper. From there you want to take off the timing belt cover. It’s important to note that on many models once you remove the cover you may have to replace it. You’ll want to consult your owner’s manual or a mechanic as both can help you determine whether a replacement cover is needed. Now you want to make sure the belt is still on the engine. After you check this you can remove the belt by loosening the tensioner. Now you can unbolt the tensioner pulley and replace it. By doing a belt tensioner replacement it should eliminate all the sounds you were hearing. This will also ensure that your belt is in its proper placement that way your engine is protected. Further, by doing regular inspections like this you can assess the condition of each component, thereby giving you an idea of when you will need to do repairs.